The contest runs Thursday, Oct. 9 to Monday, Oct. 13, 2014. The winner will be announced sometime on Monday, Oct. 13, 2014. Any retweets of any sketches after the winner has been announced are not valid for the sketch prize. Long Beach Comic Con 2014 Sketch Retweet Contest winner’s sketch choice: Star Lord from Guardians of the Galaxy motion picture. 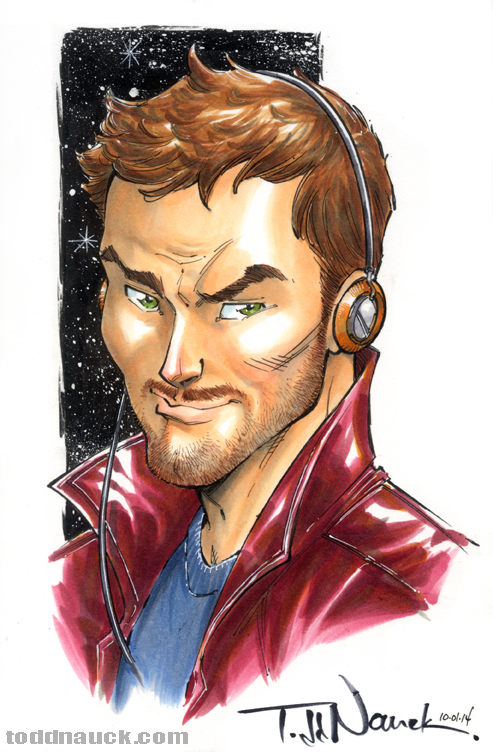 This entry was posted in Appearances, Marvel and tagged chris pratt, guardians of the galaxy, marvel, nycc, sketch rewteet contest, star lord by Todd Nauck. Bookmark the permalink. oh, and would an unpublished “Sins of Youth” version constitute a creator-owned/personal character?